While the items below look at the question from different perspectives, they all lead to the same conclusion: Arresting people for marijuana possession does not reduce the number of handguns on the streets and does not reduce crime. According to the Cincinnati Police Department's 2006 Executive Information Summary, there were 49,715 arrests for both felonies and misdemeanors. A report by Channel 5 stated that "Officers...remove nearly 2,000 guns each year from Cincinnati streets." — 1 gun seized for every 25 arrests. However, the Cincinnati Police Department's report to the City Manager in March, 2007 on the effect of CMC 910-23 over the previous eleven months shows that 3,285 arrests had been made and 62 guns had been seized — 1 gun seized for every 53 arrests, less than half the number seized for all other crimes. According to the police report to the City Manager mentioned above, less that 2% of those arrested were in possession of a gun. How does that compare with gun possession rates for gang members - that is, people more likely than the average citizen to be in possession of a gun? According to an article by Beth Bjerregaard and Alan J. Lizotte entitled “Gun Ownership and Gang Membership” (Journal of Criminal Law & Criminology; Fall, 1995, Vol. 86 Issue 1, p37-58, 22p)"...(N)early 50% of the gang members interviewed said they possessed more than one firearm and a large majority claimed to have at least one handgun." As has been shown above, those arrested for possession of marijuana are less than half as likely to have a gun as those arrested for other crimes. 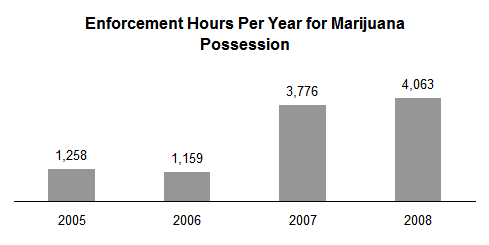 But the time police are spending enforcing marijuana possession has more than tripled since 910-23 went into effect. Under the Ohio law, writing a ticket took about 15 minutes. Under 910-23, however, an arrest for possession must be made. According to police officers, such an arrest takes about an hour from the time the person is apprehended until the officer is back on patrol. If we compare the amount of time that Cincinnati police officers have spent enforcing both the Ohio (2005 and the first three months of 2006) and the Cincinnati (nine months of 2006, 2007 and 2008) possession laws, it becomes clear why the police have become less effective in seizing handguns. In summary, the understaffed and overstressed Cincinnati police department has devoted limited assets to marijuana arrests, without achieving any of the intended goals. How much safer might we be if those assets had been devoted to dealing with serious crime?"